Take someone you love fishing! We all love to fish, right? And, February is typically thought of as a time to show your love, so it makes perfect sense to take someone you love sport fishing! Over the years we’ve all heard friends and family lament that they’d love to go fishing but they didn’t have anyone to go with. Or, they didn’t feel they had the experience, or knowledge, to go fishing by themselves. While there are times when we crave the solitude of casting a line when no one else is around, fishing is often a social activity where we invite others to go along to share the moment, making great memories to think back on months or years later. But, we don’t often think of the incredible opportunities that come from being a fishing mentor, where we can share our love of the sport to others. Need we say, to get them hooked on fishing? It’s easy, fun, and more importantly, you’ll pass along a lifetime of outdoor fun to that special person, or people in your life. 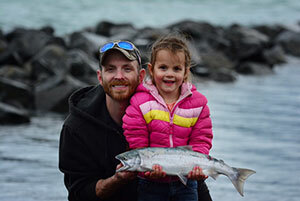 This month, we’ll share how others have thought of ways to take someone fishing, and, how to take the Five Salmon Family Challenge as a way to get the whole family involved! 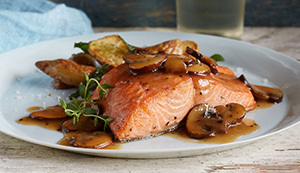 We’re starting a new idea this month, by providing a tasty recipe to try with your Alaskan caught fish. Take the “fishing hero” challenge in 2018, by taking at least one person, new to sport fishing, out for a day on the water. Subscribe to Receive Sport Fishing Updates! 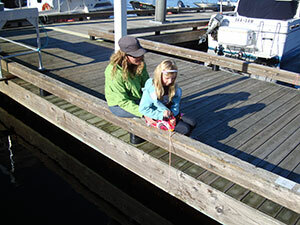 Mentoring: Anyone can, and should be a fishing mentor! Ask most folks about mentoring and they immediately think about teaching or exposing kids to new skills or experiences, or, maybe being a role model for disadvantaged youth. While these are all excellent and worthwhile examples, the Division of Sport Fish wants to challenge anglers to think outside the traditional mentoring box. People of all ages can be mentors, or the student! No matter the age, sport anglers can always pass along their knowledge about how and where to fish. The division is encouraging everyone to be someone’s “fishing hero.” Consider it an excuse to go fishing, and while you’re at it, offer to help teach and encourage someone you know, of any age, to take up fishing as a life-time sport. Creating family fishing memories just got easier! The Division of Sport Fish has established a fishing challenge that everyone is invited to join. 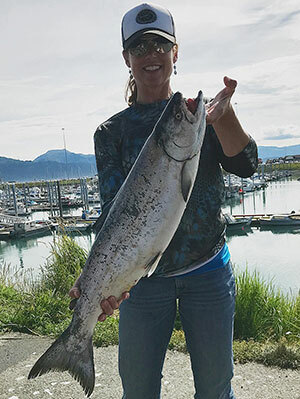 In Alaska, we have five species of Pacific salmon: king (Chinook), silvers (coho), reds (sockeye), dogs (chum), and, last but not least, humpies (pink). The division created this challenge to encourage individuals, families, or groups to catch one of each species, then, document your catch by taking a picture, with at least one common person in each picture. Once you’ve caught all five species, submit the pictures along with the Five Salmon Family Challenge application. After we receive your application, and can confirm all five Pacific salmon species, we’ll send you a signed certificate, suitable for framing. 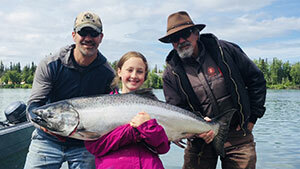 It’s a fun way to encourage everyone to fish for the different salmon species found in Alaska. Consider yourself invited to take the challenge! 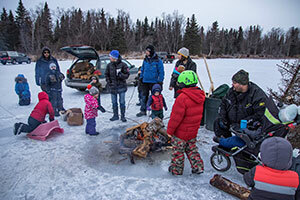 Winter is the perfect time to start planning your summer fishing trips and join in the fun! Field to Plate is a new feature beginning with this issue! Each month we’ll be highlighting a new recipe that will tantalize your taste buds using your sport-caught wild Alaska fish. The Alaska Seafood Marketing Institute has an amazing number of mouth-watering recipes that highlight wild, natural, and sustainable Alaska seafood.